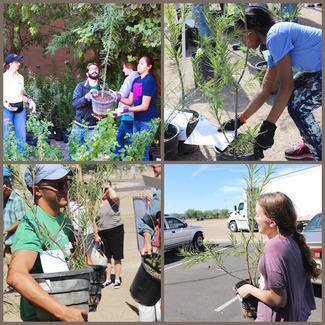 Trees Matter will be facilitating the SRP Shade Tree Workshop & Distribution Event at Mesa Community College on Saturday, May 4, 2019. Learn more about this energy efficiency program at: http://www.savewithsrp.com/RD/shadetrees.aspx . These events are volunteer-powered! And we would love YOUR help! There are many volunteer roles that help make the day a great success. You can read about each of the roles in the sign-up below, and sign-up directly for whichever sounds like the best fit for you. Volunteers will be helping to greet & direct the participants, and register participants for 2 tree-care workshops (beginning at 8am and 10am). After the workshop on tree care, the SRP participants proceed to the “tree corral” and pick up 2 free trees to take home with them. At the Tree Corral, volunteers help with set-up, filling tree orders, and verifying the correct tree orders. We also ask for several Master Gardeners or Arborists to answer participants’ questions about which tree is the best fit for them. We will have lots of snacks and refreshments throughout the morning! An email of additional details will be sent to you via email the week before the event. Note: All volunteers under age 18 will need to have a waiver signed by their parent or guardian. We will have blank copies of the waiver on site, or you can download the youth waiver here and bring it with you. Welcome all participants, direct folks to their proper registration table, direct tree questions to the "Ask the Expert" Table, and provide general event support as needed! Assist in setting-up stations. Sit at Registration table and distribute program participant information to folks as they arrive, then direct them to the classroom. Direct participants to the classroom and support the instructor as needed. Help keep the instructor on-time. Use computer software to generate registration materials for walk-up participants. Sit at the Tree Check-In table. Assist participants in completing their forms with basic information, and pass on the form to the Form Master for the tree order to be filled. Help pass on Tree Order Forms in an organized fashion from the Tree Check-In Volunteers to Tree Runner volunteers. Work in pairs to collect the trees on an order form. Carry to Tree Verifier stations for final verification. Help unload and reload trees from the truck as needed. Be prepared to lift trees in 5-gallon buckets, about 15 lbs each. Verify tree type against the order form, call out program participants' names, and hand them their new trees. Answer participants' questions about desert shade trees. These slots are filled by arborists, members of the Master Gardeners Program, or those who otherwise have extensive knowledge on desert-adapted shade trees.